The first success of a far-right party in a regional election since Spain’s return to democracy in 1975 has shaken national politics ahead a busy electoral season. Prime Minister Pedro Sánchez’s Socialists (PSOE) were set to lose control of southern Andalusia, which it has governed for over three decades, after Vox took a surprise 12 seats in a regional election on Sunday, handing a majority to right-wing parties in Spain’s most populous region. It was Sánchez’s first electoral test since taking office in June after winning a vote of no-confidence against the conservative People’s Party (PP) government of Mariano Rajoy over a corruption scandal. Top-selling daily El Pais called the results an ‘earthquake’ which have changed the ‘national political panorama’. 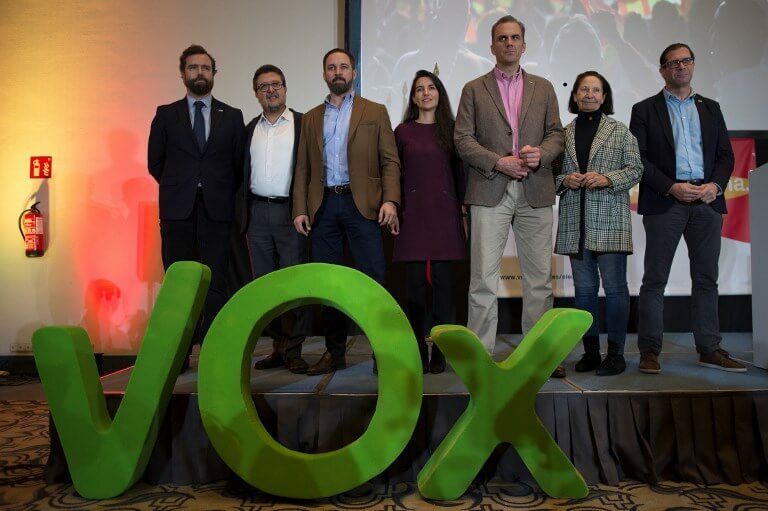 Vox, which takes a hard line against illegal immigration and Catalan independence, is the first far-right party to win representation in a regional parliament in Spain since the country returned to democracy following the death of longtime dictator Francisco Franco in 1975. Sánchez, who heads a minority government that has struggled to garner opposition party support to pass its draft 2019 budget, vowed to defend democracy. ‘The results in Andalusia strengthen our commitment to defend the constitution and democracy from fear,’ he said in a Twitter message on Monday in his first reaction to the poll results. Fernando Vallespin, a political scientist at the Autonomous University of Madrid, said Spain had ‘ceased to be the exception in Europe’, where far-right parties have already made gains in countries like Italy where they now govern. But unlike other European nations where the rise of far-right parties has been fuelled by anti-immigrant and anti-EU platforms, Vox owes its gains largely to its fierce defence of Spanish unity, he told the AFP news agency. The election in Andalusia was first outside Catalonia since last year’s failed independence push and it ‘has had the effect that many feared: the revival of an also extreme Spanish nationalism,’ Vallespin said. Vox has called for independence parties to be banned and wants to centralise power by putting an end to regional governments. The centre-right Ciudadanos (Cs), which also takes a tough stance against Catalan independence, saw its representation rise by 12 seats to 21 in Andalusia’s 109-seat parliament. Vox, which was formed in 2013, hopes to build on its win in the upcoming elections and analysts said it had room to grow. ‘The Reconquista (reconquering) starts in Andalusian lands and will extend across all of Spain,’ the party said in a Twitter message on Sunday night, referring to a long series of medieval wars waged to recapture territory from the Muslims who occupied most of the Iberian Peninsula in the early 8th century. ‘This party will start to quickly rise in the polls at the national level, and have the capacity to set the agenda,’ Pablo Simon, a political science professor at Madrid’s Carlos III University, told AFP. Vox will ‘without a doubt’ win seats in next year’s local and European elections and could win 5-6 seats in the next national election, he said. Sánchez could now call snap polls ‘to try to mobilise left wing voters with the fear of the far-right’ but this risks giving rise to a conservative government at the national level made up of the PP, Ciudadanos and Vox, Simon said. ‘It is a complicated situation and I don’t know what is the best option to resolve this dilemma,’ he added.